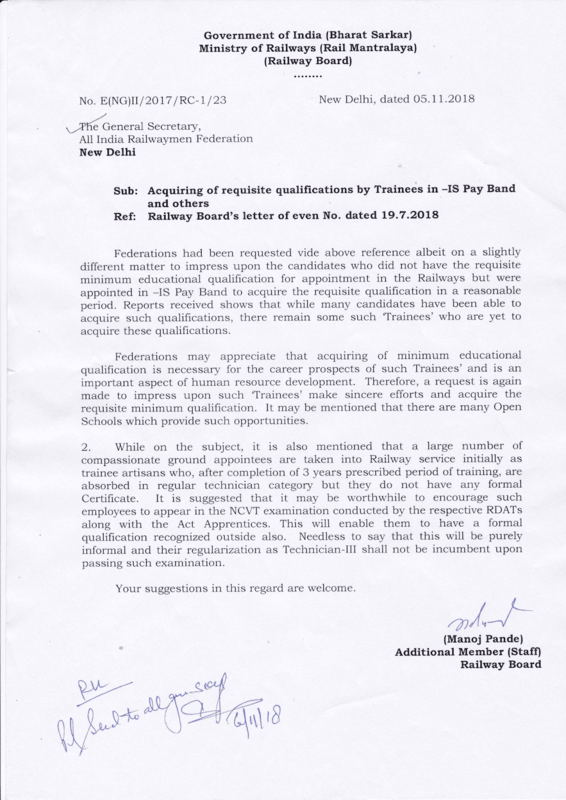 Federations had been requested vide above reference albeit on a slightly different matter to impress upon the candidates who did not have the requisite minimum educational qualification for appointment in the Railways but were appointed in -IS Pay Band to acquire the requisite qualification in a reasonable period. Reports received shows that while many candidates have been able to acquire such qualifications, there remain some such ‘Trainees’ who are yet to acquire these qualifications. Federations may appreciate that acquiring of minimum educational qualification is necessary for the career prospects of such Trainees’ and is an important aspect of human resource development. Therefore, a request is again made to impress upon such ‘Trainees’ make sincere efforts and acquire the requisite minimum qualification. It may be mentioned that there are many Open Schools which provide such opportunities. 2. 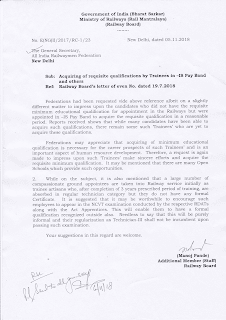 While on the subject, it is also mentioned that a large number of compassionate ground appointees are taken into Railway service initially as trainee artisans who, after completion of 3 years prescribed period of training, are absorbed in regular technician category but they do not have any formal Certificate. It is suggested that it may be worthwhile to encourage such employees to appear in the NCVT examination conducted by the respective RDATs along with the Act Apprentices. This will enable them to have a formal qualification recognized outside also. Needless to say that this will be purely informal and their regularization as Technician-III shall not be incumbent upon passing such examination. Your suggestions in this regard are welcome.